Voted product of the year - Consumer Survey of product innovation 2015. Winner nappy cream category survey of 10,175 people by TNS. For your baby's delicate skin - every day. Triple care ointment. Prevents nappy rash. Protective barrier. Conditions skin. Guards against infection. Easy one-handed use.Sudocrem Care & Protect is a barrier ointment with a unique formula designed to offer triple action protection for skin prone to nappy rash. 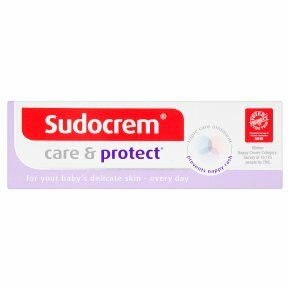 Protective barrier - Sudocrem Care & Protect is specially formulated to provide a protective barrier that seals in the skin's natural moisture to keep the skin soft, smooth and supple, whilst protecting even the most delicate skin against external irritants and rubbing that can cause nappy rash. Conditions skin - Sudocrem Care & Protect is hypoallergenic and also contains special ingredients including vitamin E and Pro Vitamin B5 which help protect the skin and keep it in healthy condition. Guards against infection - Sudocrem Care & Protect forms a protective layer which guards against infection. Sudocrem Care & Protect is hypoallergenic and has been dermatologically tested. It is free from artificial colours and preservatives. How to Use Using clean dry hands apply onto clean dry skin gently spreading the barrier ointment evenly to form a thin protective layer. Use at every nappy change to give your baby's delicate skin the best protection. Do not use on broken skin.